The art-driven non-profit and the novelty sock brand have teamed up with contemporary artists Deborah Kass, Barbara Kruger, Derrick Adams, and Rob Pruitt for a whimsical collection of socks exclusively available at Barneys. Art Production Fund’s mission is to commission and produce public art projects to reach new audiences and expand awareness through contemporary art. They found an unexpected partner in Hot Sox, the sock company that elevates the everyday sock into a platform for creative expression. Both organization and company’s dedication to thinking outside the box brought them together for a playful collaboration featuring vibrant works from well-known artists Derrick Adams, Deborah Kass, Barbara Kruger, and Rob Pruitt. 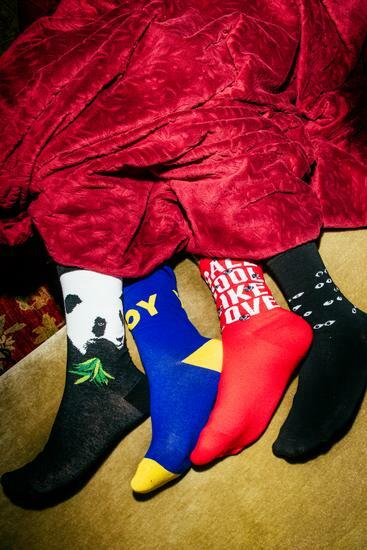 The set of 4 socks, one designed by each artist, is available exclusively at Barneys with a portion of the proceeds supporting the Art Production Fund. 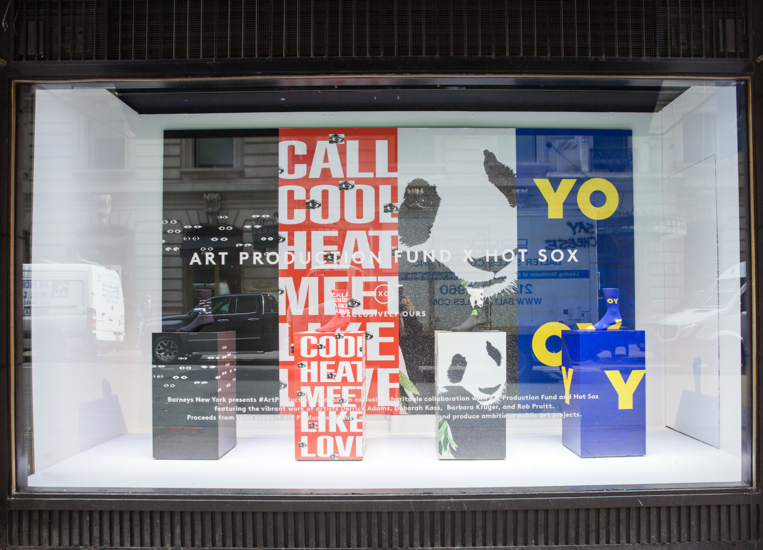 Hot Sox echoed the sentiment, citing the sock as the perfect canvas for showcasing the esteemed contemporary artists involved. “Through the decades, as hemlines have gone up and down, hosiery has consistently played an important role in culture and fashion. Hot Sox is rooted in an appreciation of the arts and the diverse combination of technique and medium used in interpreting art into wearable fashion,” says Gary Henkin, SVP of Global Sales for Hot Sox. Barneys Madison Avenue 60th Street windows will feature an installation of the collection from April 9 through 25.